Kanak Dixit of Kathmandu will embark on a fundraising drive across South Asia – from Kathmandu to Lucknow to Delhi to Amritsar to Lahore to Rawalpindi to Peshawar, to raise funds for spinal injury centres in all three countries at the rate of USD 100 per mile for a journey of 1,100 miles (EUR 45 per kilometre, GBP 62 per mile, INR 3,089/km) or 1,760 kilometres. The Journey: Our 1973 model VW Beetle will start its journey from Kathmandu Valley on 4 of November 2011. Coming down to the plains, it will enter Uttar Pradesh and reach Lucknow. Westward to Delhi, it will arrive at the Indian Spinal Injuries Centre (ISIC). Travelling along the Grand Trunk Road, it will pass Amritsar and the Wagah-Atari border to Lahore and its Mayo Hospital. We will then take the M-1 motorway to Rawalpindi / Islamabad, and end our journey at the Paraplegic Centre in Hayatabad Peshawar on 16 November 2011. Why the Adventure: The sudden rise of the number of patients over the last year has forced us to raise our service from 39 beds to 51. This has led to an unexpected financial crunch. The rally will help meet the challenge of growth even as we make plans for sustainability. One More Reason: The Spinal Beetle Rally is also an effort to raise awareness of spinal injury prevention, rescue, care and rehabilitation in the Subcontinent. In this effort, the Spinal Centre is assisted by ISIC-Delhi and the Paraplegic Centre-Peshawar. The Rallyists: The Spinal Beetle will be driven by journalist and civil rights activist Kanak Mani Dixit, Founder Chairman of the Spinal Centre Nepal. He will be accompanied by Shanta Dixit, board member and educationist. It was Kanak’s trekking accident a decade ago, resulting in a broken spine, which led to the establishment of the Spinal Centre. That's the route plan for the Spinal Beetle, parathas and chicken tikka not included. 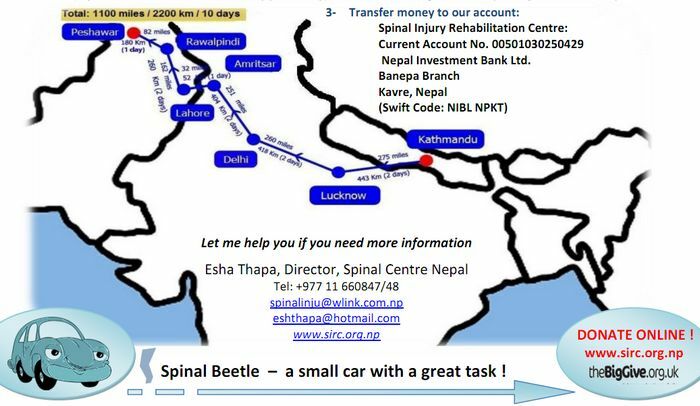 Done it Before, Twice: Kanak has driven the Spinal Beetle Kathmandu-Dhaka, in 2002 and 2005, to generous response. Support and Sponsorship: The Indian Spinal Injuries Centre in Delhi is 540 miles from Kathmandu. The final destination, the Paraplegic Centre in Peshawar is 1100 miles away. Supporters are asked to sponsor the drive at the rate of USD 100 per mile, or any fraction or multiple of that amount. Payment details are given below. If you find the payment procedure cumbersome, please just pledge and we will revert. About the Spinal Centre Nepal: Inaugurated by Sir Edmund Hillary [the mountaineer, think ‘Everest’] on April 2002, the Spinal Centre will be ten years old in 2012. Originally catering to patients from traditional accidents such as fall from trees and cliff-sides, spinal injury victims of ‘modern-day accidents’ related to construction, rock mining and traffic events are more and more filling our wards. We offer physiotherapy, occupational therapy, nursing, medical care, counselling and home rehabilitation. We are also involved in prevention. The Spinal Centre is run by the non-profit Spinal Injury Sangha Nepal. Jump in and donate your MILE! Send us the equivalent of USD 100, or more or less! 1. Donate online on our webpage www.sirc.org.np : through our project partner Livability Ireland at the Biggive – free of charge!